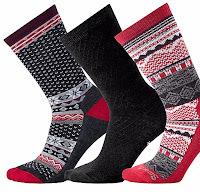 Speaking of my keep-warm favorites (from yesterday), I got several pairs of Smartwool socks last year that I LOVE. Hubby warned me not to fall in love with the fancy compression ones (too expensive for SOCKS? ), they are indeed my favorite. But I have a pair that aren't compression too, and they're still quite cozy. In the interest of warmth, I don't want those low cut little cold-ankle socks. Bare flesh defeats the purpose. These crew numbers are cute, or they have some knee socks too. And since I don't have anywhere fancy to go, fun prints are always better. Socks are my favorite. I like the soft fuzzy ones the best.